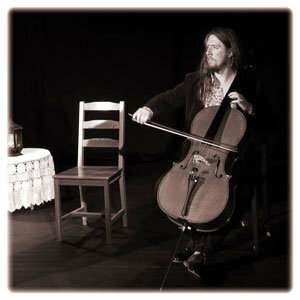 Alex the cellist is a Perth-based musician who blends modern improvisation with his classical roots and accompanies storytelling events across Perth. Following graduation from Perth Modern School Alex received a bachelor of music in classical performance from WAAPA in 2013. During university he studied the cello under Michael Goldschlager and was introduced to improvisation by Australian violinist Rupert Guenther. Over the years Alex’s endeavours have varied from; performing at the Adelaide Fringe with the Remnant Dance Company, Street Busking with his “Hey Street Quartet” in the Hay St Mall, providing the score to the acclaimed show “Golden Age” at WAAPA, and now performing as part of the Tealeaf troubadours across Perth and Western Australia’s South-West. Alex has joined the visiting artists portfolio at The Sound Temple to share the incredible gifts of combining live composition with the art of storytelling. The lost art of Storytelling is a rich and ancient form of communication, weaving myth, magic, history, creativity, wisdom, legend, story and metaphor together to create an experience that will absolutely delight. Join some of Perth’s most engaging storytellers at The Sound Temple for a sumptuous, all senses immersion, into powerful story and traditional sound. Bringing ancient healing tales from around the world, renewing lost legends of Ancient Civilisations, weaving stories of Myth, Magic, Ritual and Metaphor, these exquisite events are like nothing you’ve experienced before. At The Sound Temple we are committed to the revival of these incredible events, we have the perfect venue and the bush setting in Perth Hills to support the healing and transformations that are formed during the lost art of story.